← Indoor pool Oberhausen, Rhein-Herne Channel and etc..
After my work I usually go directly to home. But in the last two days I enjoyed the nice warm autumn weather on my bike and in the environment of my work. Today I was in Düsseldorf-Rath. 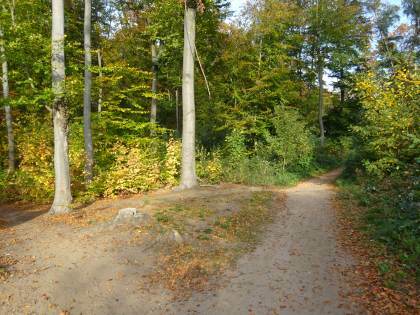 A quarter with 20.200 habitants that is located in the east of Düsseldorf near Ratingen border. First I have discovered the ISS Dome. It is a big multi functional arena for 14.282 visitors. 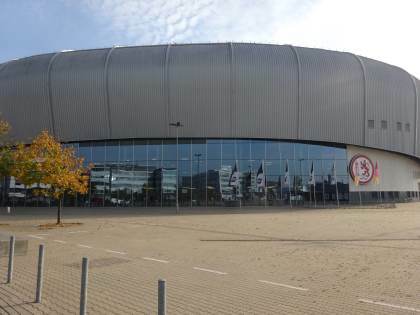 It is the home of the ice hockey club Düsseldorfer EG that was founded in 1935. They were playing in the ice sports hall „Brehmstraße“ but it was too old and not up-to-date. So they moved to the ISS Dome. You can go by tram line 701 to the ISS Dome either from the station Düsseldorf-Rath. I crossed below the station Düsseldorf-Rath which is operated by the train S 6 (Essen-Cologne) in order to get the stadium Wald in Rath and tram route of the line U72. But I did not find the stadium. So I bicycled to the south. The leaves have changed to the rubiginose. The autumn is a nice season if it is dry and not wet. It was a nice short excursion in Düsseldorf that has found the end at the station Düsseldorf-Rath Mitte. Here stops also the train line S6 which I took back to Essen. Dieser Beitrag wurde unter Ausflüge, English abgelegt und mit autumn, bike, DEG, Düsseldorf, icehockey, Rath, S6 verschlagwortet. Setze ein Lesezeichen auf den Permalink.